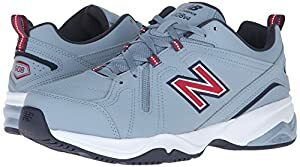 If you’re looking for a supportive walking shoe, look no further than the New Balance shoes for plantar fasciitis on this list. As you know, anyone with a difficult foot condition has a hard time finding shoes catered to their needs. Those of us with plantar fasciitis do not underestimate the value of a quality shoe. Lucky for us, New Balance is known for making just that – quality shoes made with added support for those pesky foot conditions, which can put a damper on your day-to-day activities. These are going to fit those custom insoles and provide the support you need to reduce heel pain. I’m excited to show you the top plantar fasciitis New Balance shoes. To begin, we have the rustic-looking New Balance Women’s WX608V4 Training Shoe made with leather and synthetic. This shoe brings all around comfort and stability to your walking experience. IMEVA midsole support does well to keep your arches happy and free of pain. Stiff side panels also keep your feet steady and well-aligned to assist with pronation. I loved these features as a plantar fasciitis sufferer. New Balance’s ABZORB technology absorbs shock as you walk preventing unnecessary pain in your joints. The outsole features an impressive tread that you can take on hikes. The supportive layers also keep the feet warm in colder weather. It’s even waterproof. They really thought of everything for these shoes. Even with all of the technology, these New Balance plantar fasciitis shoes remain lightweight and easy to walk in. I think you’ll find these some of the most comfortable walking shoes you can get your hands on…or your feet in. A running shoe can be optimal as a walking shoe. They are made with added support, which works well for people with plantar fasciitis. New Balance crafted a great model in the NB W1340v2 Optimum Control. They implemented superior motion-control and extended web technology. This aids in stable heel-to-toe transition when you walk. New Balance used a rubber compound on high-wear parts of the shoes to extend their life. 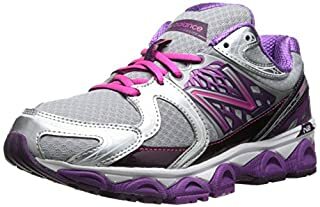 The upper is made with mesh lining to allow for air ventilation, and the toe box is nice and roomy, great for those of us with bunions or flat/wide feet. You also get the nice ABZORB cushioning in this shoe. The stabilizing nature of these shoes makes these great for easing back, knee, and hip pain. My only complaint is that these seem to be a little heavier than other models. Probably the best-looking shoe in this list, in my opinion, is this New Balance Fresh Foam 1080v6’s. Many of them come with ombre detailing which I love. Besides the style, these also win in durability and superior cushioning. Blown rubber makes up the outsole of the shoe while the midsole and insole are made with flex grooves. These increase flexibility while remaining stable and durable. The interior is made with thick, soft cushioning and has an extra wide footprint. Many users compare wearing these shoes to walking on air. The mesh upper also lends to this statement, as it allows air to pass through. Arch support is sufficient in these shoes, but you can insert your own if necessary. The interior Booty Fit system wraps around the back of your foot to ensure it doesn’t slip off while you walk. I really enjoy these shoes for their comfort factor and long life span. You can expect to wear these 6 months to a year with frequent wear. Another great looking New Balance plantar fasciitis shoe with added comfort. This shoe wins in support, which is our favorite feature to hear as a plantar fasciitis sufferer. The Zantev2 is a running shoe made with cushioned arch support and the Fresh Foam midsole. The overall structure of these shoes made for great pronation control and back support. They’re made with the same Bootie construction as the previous Fresh Foam model I mentioned. Mesh covering keeps these shoes breathable, and the outsole tread has good grip. For all of these features, the shoe still remains lightweight. They also come in nice colors and with reflective detailing, great for night or early morning walks. I would be careful with custom inserts. Some may find their inserts take up too much space in the shoe and your heel may start to pop out as you walk. Many people find that the arch support in these shoes is sufficient. Last in the list we have the W1500V2 Running Shoe. New Balance really placed lightness at a premium with this shoe. The mesh upper is called Fantomfit because you barely feel it. The REVlite foam midsole is also lightweight but still structurally solid for stability. A T-beam shank offers torsional stability and good arch support. The entire shoe wraps around your foot in a nice glove-like fit. A grippy outsole provides good traction. Many wearers talk about how these shoes are like walking on clouds. As the lightest shoes in this list, it’s hard to not believe that statement. These come in bright colors for those walkers who would like to be seen. Your feet will be able to breathe nicely with the mesh overlay. Since this shoe was made with lightness in mind, some wearers may find that they don’t provide enough cushioning. I would try some on first before making a judgment call. 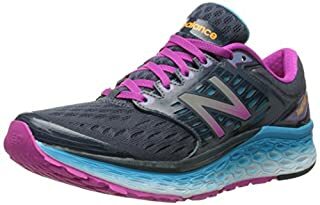 If you haven’t tried New Balance walking shoes for plantar fasciitis yet, I would highly recommend it. They make their shoes for not-so-average feet. Plantar fasciitis shouldn’t keep you from walking! Your shoes can help ease the pain with plenty of support, cushioning, and stability. I’m sure you’ll be able to find a pair that works well for you from this list. Have a nice walk in your New Balance sneakers for plantar fasciitis!